The secretary-general of Asa’ib Ahl al-Haq, an Iranian-supported Iraqi militia group, has threatened that its forces will fight Israel to seize Jerusalem, according to Shafaaq, an Arab outlet. “The Iraqis will be the first to enter Jerusalem,” Qais al-Khazali said today, in reaction to the transfer of the U.S. embassy from Tel Aviv to Jerusalem. 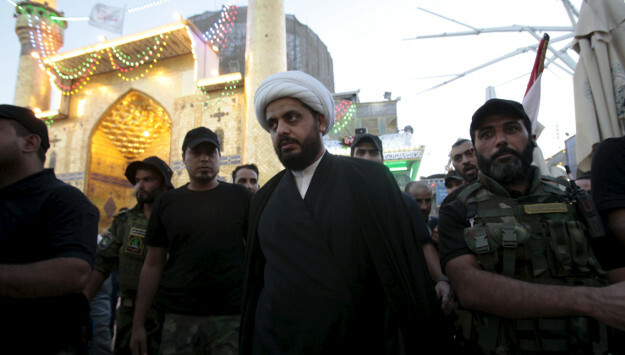 “No matter in what situation we are in Iraq – [whether we’re] at war or in peace, or have hardship or prosperity – we will never forget and will never give up on the cause of Arabs and Muslims,” said Khazali, who is blacklisted by the United States for his acts of terrorism against the American forces prior to 2011. “Jerusalem is the eternal capital of Palestine,” he wrote on his official Twitter account. Khazali, whose group contested the Iraqi elections as part of the Fatah Alliance, also accused the U.S. Embassy in Baghdad of undermine voter participation in the Iraqi elections by issuing security warnings ahead of the polls. Comment: Asaib Ahl al-Haq – or the League of the Righteous – is an Iraqi Shiite militant group fighting in Iraq and Syria. The militia receives government salaries as well as funding from Iran. It reportedly has more than 10,000 fighters. According to the U.S. government accounts, the Lebanese Hezbollah upon a request by the Iranian government helped form and train AAH in 2005 to carry out attacks against the U.S.-led coalition forces in Iraq. AAH started as a splinter group of the Mahdi Army, the powerful Shiite Iraqi paramilitary force led by Muqtada al-Sadr. AAH has been accused of killing American soldiers and committing human rights abuses against Iraqi Sunnis. AAH is part of the Fatah Alliance, and according to preliminary Iraqi election results, more than a dozen candidates from AAH have emerged victorious. Khazali has recently stressed that the Fatah Alliance will use its influence in the next Iraqi government and parliament to “expel” the US forces from Iraq.